Can't wait for Sony Ericsson to produce a PSP Phone? Well, then you better settle for a Wii Phone because that's what the Sony Ericsson Yari is. The Sony Ericsson Yari is Sony's latest slider phone with motion-sensor gaming function. Anyways, I just got this one so the full review will be coming up maybe this weekend so watch this page. In the meantime, here are some Sony Ericsson Yari pics to get you by. 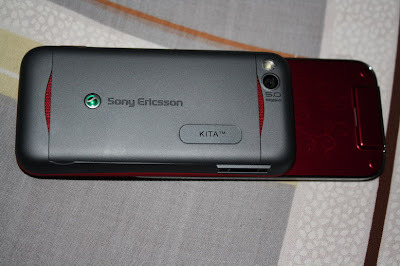 The one I got is from the Philippines which is named as the Sony Ericsson Kita, but it's actually the U100i with a different branding, kinda like the Samsung Genio here which is known as the Corby in other countries. Apparently, "Yari" has a bad connotation in the Philippines so they opted for "Kita", which in the local language, has three different meanings depending on how you pronounce it: "You", "to see", or "Profit", SE is probably gunning for the last one to lure in profits for the last quarter of the year. 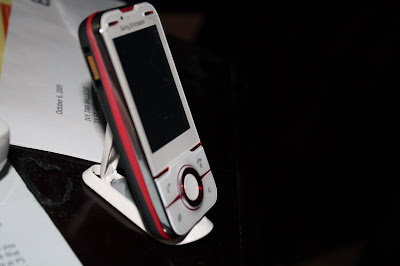 The Sony Ericsson Yari comes in two colors: The black with white highlights and the white with red highlights. In a girl's perspective, the white/red version is more appealing. The white Yari actually reminds me of the white Sony Ericsson W595. 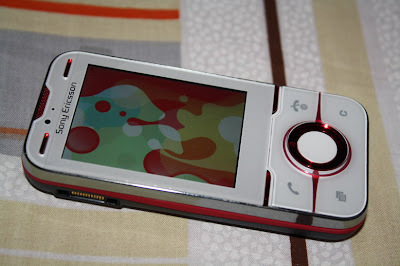 Design-wise, I can't say that the Sony Ericsson Yari is "stylish" but I'll go as far as describing it as "cute", at least, for the white one. I have to lash out on Sony Ericsson about the way they designed the key layout of the Yari. First of all, I appreciate that the call, end, task, and delete buttons are BIG. And I do mean, super big compared with Sony's Walkman phones, as the buttons occupy almost 1/4 of the entire mobile phone. Now here's where I lash out, the soft buttons or the ones you have to press when you want to go back or call up the options menu. If you've come to this page trying to find out where the soft buttons are: well, they're the red (in the white version) or white (in the black version) line above the call and end buttons. At first glance, you might think that they're just there for aesthetics purpose so a LOT of first time users probably ended up pushing the call button when trying to call up the options menu. It's just annoying at first but you'll get used to it over time. The two red or white lines above the Sony Ericsson logos also serves a purpose: they're gaming buttons. For what games, I don't know as I still haven't made use of them. The back of the Sony Ericsson Yari has a soft, velvet-like finish which I like and there's a graphic design at the back of the top slider which would definitely appeal to teeners. The battery cover is easier to take out compared with the W595's back cover and it's not as flimsy so I have to say that the Sony Ericsson's build quality is quite good and the slider mechanism is also not quite as shaky compared with other Sony Ericsson sliders. The microSD slot is conveniently located at the upper right side of the phone, and yes, you read that right, MICROSD and not Sony's proprietary memory stick. I guess Sony is trying to go standard but I wonder why they still put in their proprietary port instead of a MicroUSB slot as what they have agreed with the EU? Maybe we'll see a micro USB slot for Yaris here in Euro. At first glance, Sony Ericsson Yari's homescreen doesn't seem to be much different compared with other mobile phones made by SE, in the sense that it still has a flash UI. But dig deeper and you'll find out that Sony is jumping in on the Facebook homescreen wagon. Yep, the Sony Ericsson Yari has its own Facebook widget. Your friends' pictures together with their status updates will appear on your screen. With the facebook application on your homescreen, you can update your status instantly or get notifications on who "poked" you right from your homescreen. The Facebook app is actually quite nice and who knows, if mobile phone manufacturers keep pushing this social networking trend, I might be forced to actually like Facebook and read my friends' status. Another new thing on the Sony Ericsson Yari is the introduction of threaded messaging. If you click on the messaging icon, there's a "conversations" options which is actually your SMS inbox. The messages icon is for emails and there's also a shortcut that would take you to your Facebook inbox via Facebook for Sony Ericsson. Setting up your email account is not as easy compared when setting up email on Samsung's mobile phones. I tried setting up my gmail account but it had to ask me for Pop or IMAP settings which is a real pain, really. I really like the new threaded messaging and the shortcut to attach pictures, videos, animations, etc can still be located at the bottom of the screen. Aside form the Facebook app, other applications included with the Sony Ericsson Yari include a Calendar Wallpaper which is like a screen saver, Music Quiz, PullFace 2, Voice Transformer Walkmate, YouTube, and Wisepilot. The Sony Ericsson Yari has assisted GPS which means you can incur data charges when you want to use the navigation software. The 2.4 inches screen can display 256k colors and watching videos is okay though it would have been nicer if it has divX support. I also like the music player on the Sony Ericsson Yari. The Yari's music player has some sort of skins so instead of the Album Art, you can choose to view other animations such as a tape deck, CD, vinyl CD, etc. Even though the speakers are located at the back, the Yari is able to blast loud music through the speakers even if you place it face-up on a table. Bass is okay though some acoustics come out tinny. I'd recommend using your own headset or stereo Bluetooth headset to appreciate sound quality. The Browser hasn't improved much, still slow and doesn't support flash or tab browsing. You're better off downloading Opera Mini 5. The Sony Ericsson Yari is equipped with a 5 megapixel camera with LED flash. Image quality is pretty decent although suffers at low light conditions. The LED flash doesn't do a lot even when you're in a room that's lit. The good news is that it has smile detection and face detection. About time that Sony Ericsson added a few fun things on their cameras. It also has auto focus although the shutter speed is pretty slow compared with some Samsung phones. Now we come to what the Sony Ericsson Yari is all about: Gaming. You'd think Sony would have went out and made a PSP phone by now in order to compete with iPhone in the phone gaming department but nope, instead of a PSP phone, we get a Wii Phone. I guess Sony Ericsson is jumping the gun on Nintendo in case the latter decides to enter the mobile phone market. Well, back to the Yari, the Sony Ericsson Yari is all about motion-sensor games. The phone makes use of the front camera to detect your movements and translate it to game language. There are two pre-installed motion sensor games on the Sony Ericsson Yari: Fitness and Tennis. There are two more you can download for free at the PlayNow store: Boxing and Baseball. The motion sensor is actually pretty sensitive and is useable. I was able to play Fitness and Tennis though it's my first time playing motion games (yes, I'm one of the few who doesn't own a Wii) so I ended up playing harder than necessary. But here's my problem: the screen is just too small for you to play longer than one minute and though the Sony Ericsson Yari comes with a stand (or you can imitate the Yari commercial and have a friend hold the phone up for you while you flail around), nearsighted people will have to wear glasses or risk punching the phone on accident. Maybe I'm just too old to appreciate motion games on a mobile phone but even if it weren't for the games, I still actually like the Sony Ericsson Yari. It's cute and, has a good build quality, a good messaging and music phone, decent camera at mid-range price. Sure it doesn't have WiFi but it 3G/HSDPA more than does it for me. The Sony Ericsson Yari is priced somewhere in the middle. In this age of touchscreen mobile phones, I'm sure the Sony Ericsson Yari won't find it hard to find its way into the hearts of some teenagers. All the phones here are very good. the shape reminds me of a samsung, but this will be much better of course http://www.puremobile.co.uk/Sony-Ericsson/Sony-Ericsson-U100i-Yari-Black-GSM-Phone/ has it already unlocked. wow! thanks for the review about the Yari phone. :) you're right about the word Yari here in the Philippines and it doesn't sound good. have to think about buying the phone for xmas. I hate the keypad. Very flat. I love the games on this phone. Sony Ericsson preloaded it with a lot of goodies, unlike Samsung which only loads their phones with trial versions. Sony ERicsson's going under. The Satio is crap and so is the Aino and they're not even doing any proper marketing for the Yari. The X2 has long been announced but delays are making SE fans irritated. I'm totally in love with the Facebook app. I do wish the Facebook app could perform faster. There's Baseball, Boxing, Bowling, Tennis and Fitness, with only Bowling responding well to gestures and none of them coming even close to being fun..
Just go to conversations in messaging. Sony's latest slider phone with motion-sensor gaming function is very attractive. I love this model.